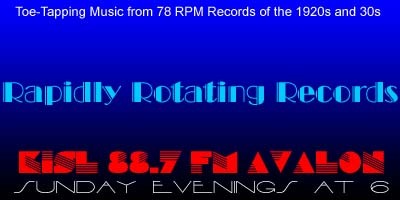 Welcome to Glenn Robison’s Rapidly Rotating Records, bringing you vintage music to which you can’t *not* tap your toes, from rapidly rotating 78 RPM records of the 1920s and ’30s. On this week’s show were going to celebrate the birthdays of Paul Biese and Merton Bories, go on a diet, fulfill a promise and…that’s all. Big Broadcast Medley, Part 2 – Debroy Somers and His Band / Dan Donovan, Carlyle Cousins, v.
Lonesome, That’s All – Wayne King AHO / Wayne King, v.
If you enjoy the show, please let us know by leaving a comment on the website or the Facebook page or sending an email to Glenn@RapidlyRotatingRecords.com And remember, your requests and topic segments are always welcome.